Five Mondays in June brought five incredible guests to the Social Pros Podcast: a digital marketer for the WKYC TV station; the social media fan, iSocialFanz; two content marketing experts, one from BuzzSumo and the other from the Content Marketing Institute; plus the world’s Facebook expert at Mari Smith International, Inc. When it comes to content, you have to give it away for free. When it comes to social media, you have to pay to play. To build a loyal audience, you have to create content that is helpful to people, and what’s more, you have to be willing to give it away for free. It’s a long game, but it will pay off when you have a following that trusts you and advocates for you. So go ahead, give your content away for free. And while you’re at it, write social media marketing into your budget, because you’ve got to pay to play. Businesses are no longer able to effectively reach target audiences organically on platforms like Facebook and Twitter. If you want to continue to build on the work you’ve done online, you’ve got to shell out or get out. 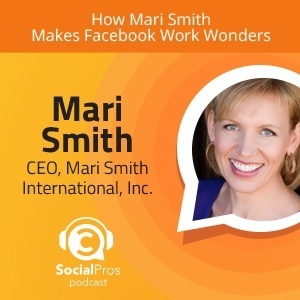 Mari Smith is the CEO of Mari Smith International, Inc. and author of “The New Relationship Marketing. She’s also the lead instructor of Facebook’s Boost Your Business tour to help small businesses better utilize Facebook to reach their audiences. As someone whose job it is to be in the know on Facebook’s constant changes and updates, Mari is very aware of the dramatic plummet of organic reach in the last year or so. Measuring success in today’s world is really about getting those ads right. More and more small and medium-sized businesses are realizing they have to have an ad budget. Beyond that, they are working to figure out how to place good ads and get conversions. And it’s not just about Facebook, Mari says. “You can’t silo Facebook, you can’t really silo your ads. If you really want to get strong results, the ad budget needs to be spread across two platforms.” Find out where your fans hang out and reach them there; usually that’s going to be more than one place. But remember that to make money, you’re going to have to spend some first. 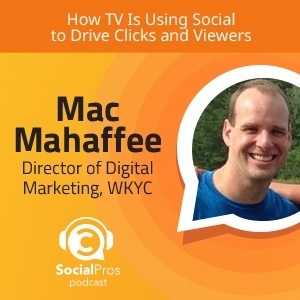 Mac Mahaffee is the Director of Digital Marketing at WKYC, Channel 3 in Cleveland. His job is a little bit of everything, but essentially he makes sure to get the word about about all of the station’s initiatives, while also trying to attract audiences to all of their digital platforms. Mac uses paid social media in two different ways. Day-to-day, Mac and his team pay attention to posts that gain momentum organically and then amplify that reach by paying to boost them on social media. Rather than setting up a regular paid campaign, they focus on posts that are already gaining traction. Everybody can do a crazy ad, but what’s the value 46 months later? Do something you can measure. The other way they utilize paid social media advertising is by giving specific promotional campaigns an added edge. For example, they amplified their Super Bowl ad through every platform they could, firing “on all cylinders, all channels, to get the notice out.” They created a 15-second Super Bowl ad with a contest to win $10,000 for downloading their app. The cost of the ad, giveaway, and all of the paid social advertising was well worth it for them; at the end of a 48-hour window, downloads were up 1600%. 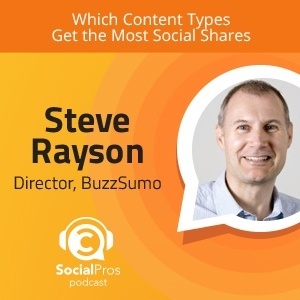 Steve Rayson is the Director at BuzzSumo, a company built to examine different types of content from all angles and find out what performs best—a valuable tool for Social Pros and any content marketers out there. People definitely like sharing helpful content. People like to do their jobs quicker & better. They built relationships with 20–30 people that were authoritative and had respect and trust in the field. It’s in the building of those relationships where the idea of “free content” comes in. To build relationships with influencers, Steve and his team tried to be as helpful as possible to the influencers they identified, without asking for anything in return. At BuzzSumo, they’re able to provide helpful data and research to influencers who can use it for their own benefit, turning them into advocates for the BuzzSumo brand. Steve doesn’t pay to play, but he does give away valuable data for free. 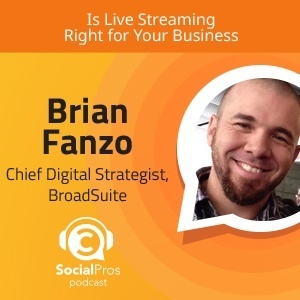 Brian Fanzo is the Chief Digital Strategist at BroadSuite Consulting and is also known as iSocialFanz. He loves technology and is an early adopter of anything he can get his hands on, including Meerkat and Periscope. Brian’s advice to any company trying to grow their audience is, “Think like a fan.” No matter what type of content you are creating—whether it’s live streaming video, writing a blog post, recording a podcast, or whatever else—ask yourself, “Would I find this helpful? Would I want to watch this/read this? Would I want to share this with anyone else?” If your content isn’t helpful to your audience, it won’t get seen or heard. Provide access to things that you think your fans would love to see. That may sound like a simple enough approach, but it’s much more complex when you put it into practice. It takes a strategic approach to capture and hold your audience’s attention amidst the noise. One ad (for example, on TV), isn’t enough. That one ad has to fit into your marketing ecosystem to build relationships (your social media platforms, your website, anywhere else you want to reach your audience). 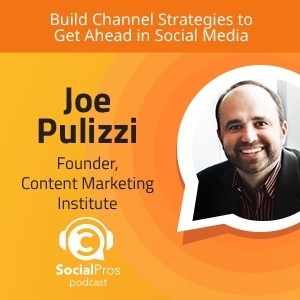 As an expert on and advocate for content marketing, Joe is a big believer in “a rising tide lifts all boats.” Joe will give content away for free, even things that they would normally charge for (within reason). His latest book, “Content Inc.” looks at several successful entrepreneurs who started out with content surrounding a passion or audience pain point and built a following by providing useful content for free. I will give anything and everything away.